Providing you the best range of forged elbow and nickel alloy 200 forged fittings with effective & timely delivery. We sell NEW, SURPLUS Nickel 200 Forged Fittings. 6) Ranflex Metals has been an authority in the Nickel 200 Forged Fittings industry for over three decades, we are an industry leader in stocking, manufacturing, and fabricating quality products. 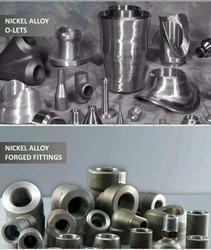 Looking for Nickel Fittings ?